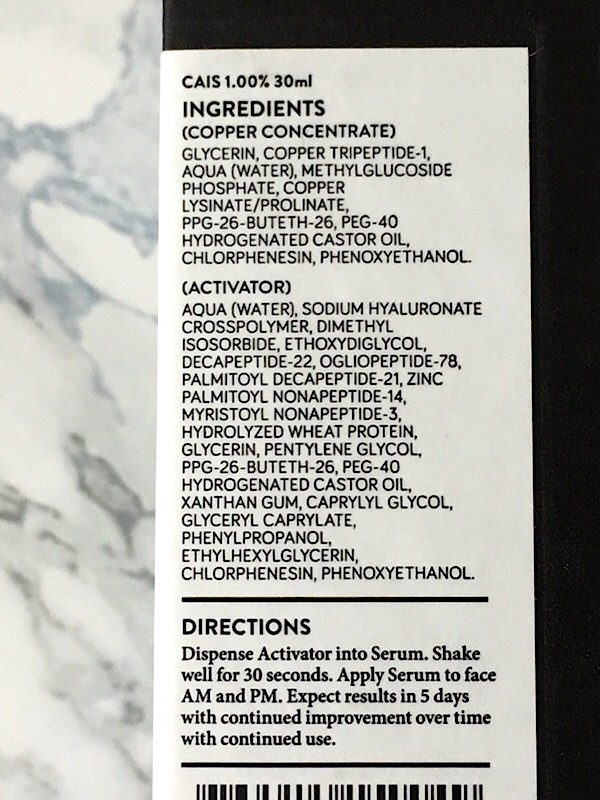 I’ve been using it about 1x/day for the last four months and just started using the reformulation (CAIS2). It’s purrricey ($60 for 15ml and $90 for 30ml) but so darn effective. And did I mention blue? 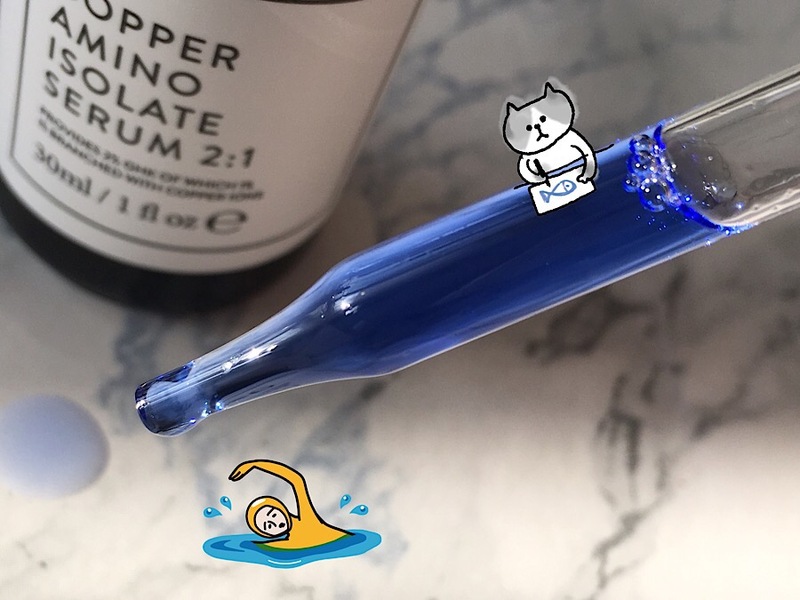 Update: A cheaper alternative from sister line The Ordinary, Buffet + Copper Peptides 1%, is now available for $28.90 for 30ml. 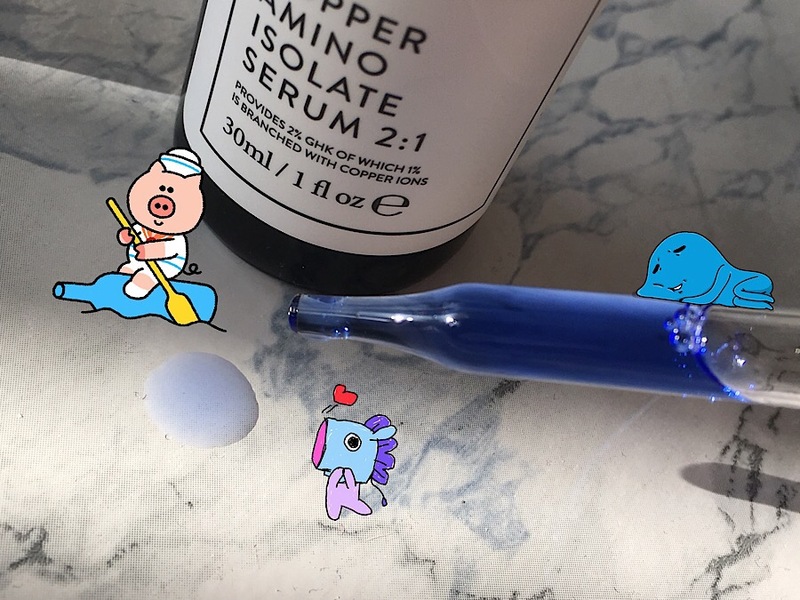 My first experience with copper peptides was with CAIS 1.00%, which was discontinued and replaced by CAIS2 in November. Technically, I have version 6.2.001. 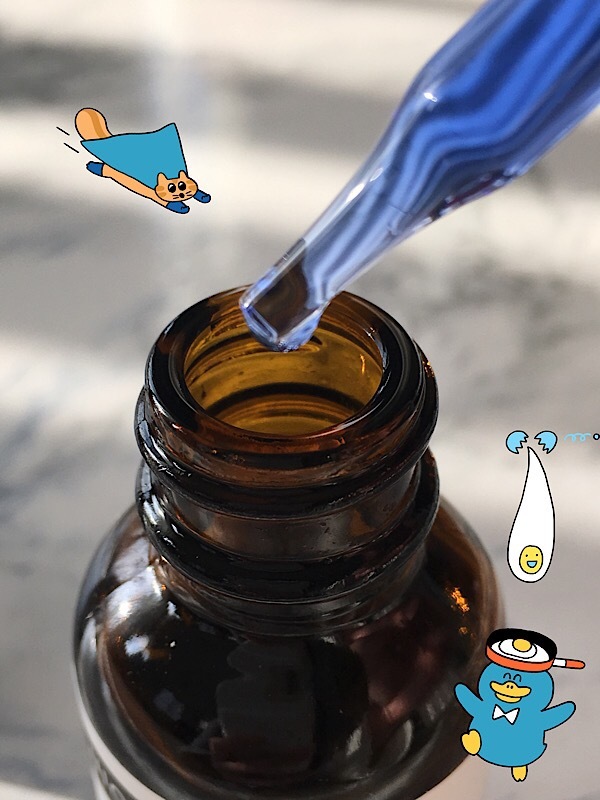 CAIS comes in the form of two bottles: Pour the bottle filled with the clear liquid into the bottle with the blue liquid, shake for 30 seconds, et voilà! I apply 1x-2x/day. To be honest, only 1x/day on average because I’ve been slacking on washing my face properly at night. But I still saw results! I apply it all over as the very first step after cleansing and patting dry. I like to drip it directly onto skin and smooth it on with my fingertips. The water-like texture makes for quick absorption and no residue. 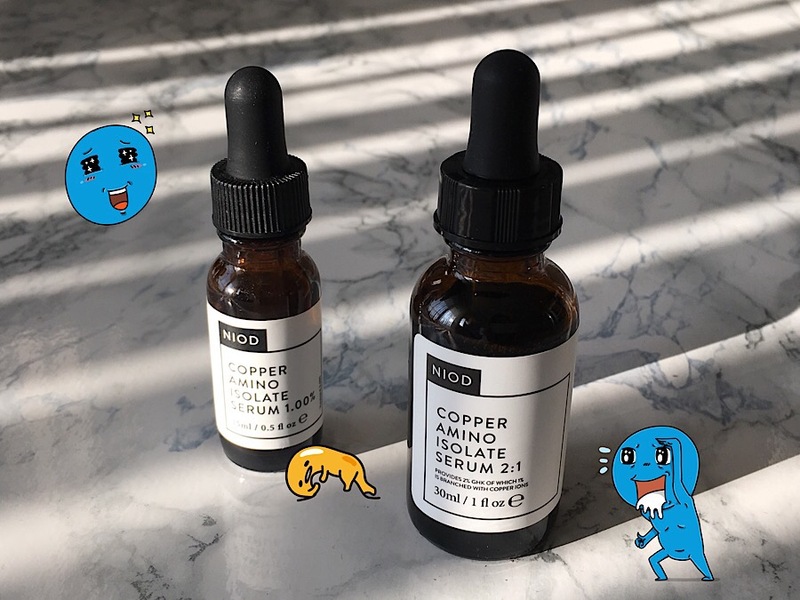 I wait for about 30 seconds to let the copper peptides sink in and then move onto serums. I’ve actually stopped using toner because CAIS is very sensitive to acidic pH (more on that below). Within a month, the redness around my cheeks and nose all but disappeared. Although the redness was minor to start with (it’s not rosacea), it evened out my skin tone enough that I felt good stepping out with just translucent powder on instead of mineral foundation. However, the effects are pretty short lived: skip a day of CAIS and the redness creeps back in. Perhaps it’s a placebo effect, but I also think my jawline looks a bit tighter/less jowl-y after using CAIS regularly. I’m hopeful that long-term use (along with tretinoin) will bestow me with the skin of Lenin even as I get older. Just have realistic expectations. CAIS is not a miracle worker or do-it-all. My skin can still get overexfoliated or dry or develop a zit…but overall and on average, CAIS keeps it in great shape. Minor complaints: It absorbs so fast that it’s hard to stretch the product (which you wish you could do given how much this costs!) Also smells faintly of vinegar? I only noticed this after using it for months. NIOD CAIS2 is as blue as ever. 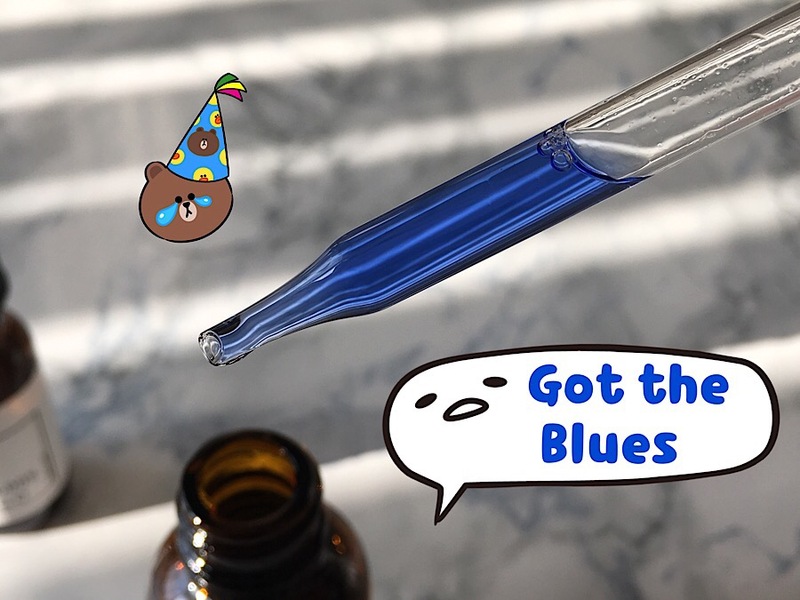 When I mixed the bottles together, I noticed that the proportion of blue liquid was higher than the original CAIS came with. Sadly, I ran out of the original and can’t tell whether CAIS2 is moar blue. No matter, it’s stunning and vibrant. Based on the ingredients, I expect CAIS2 to work at least as well as the original. Jan. 28, 2018 Review: CAIS2 works just as well as the original. There’s a slight scent of vinegar that dissipates soon after application. In the short term, it works as well as–but not better than–the original. In the long term, it should be more beneficial, but those effects are hard to gauge. The description of changes from the original is unnecessarily confusing. 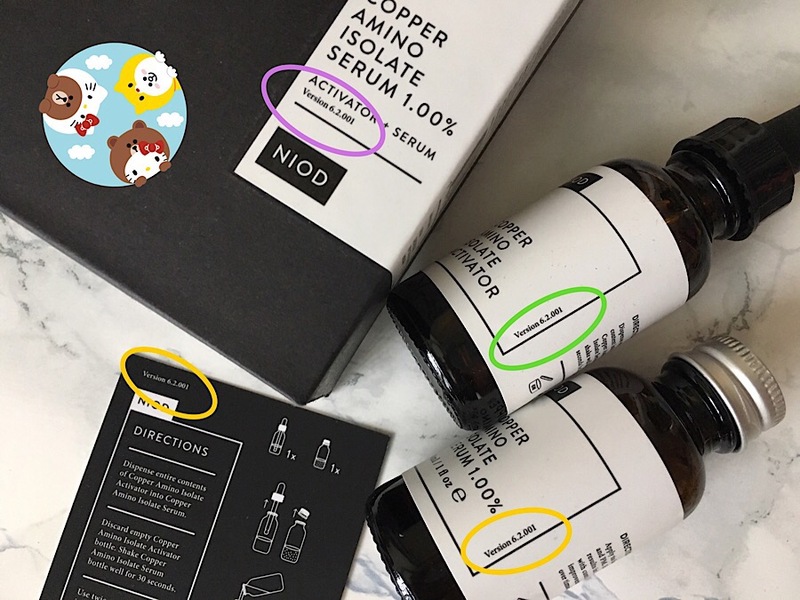 Deciem/NIOD’s marketing heaps on scientific terms at the expense of accessibility and clarity. For example, the label touts: “Provides 2% GHK of which 1% is branched with copper ions.” Um okay. EDIT: That statement refers to the fact that the reformulation now provides a total of 2% GHK (a tripeptide), of which 1% is GHK-Cu (copper peptide) (the same 1% concentration as in the original CAIS). Through all that, I did glean that the new version is improved because it’s less sensitive to pH. CAIS2 is stable and effective between pH 4.5 and 7.4. In short, less need for a wait time and less fear that a mildly acidic product will render it ineffective. Any acidic pH will destroy CAIS completely in an instant. However, CAIS itself is absorbed and utilized extremely quickly. Acids, however, take longer to work and go through a pH adjustment after application to the skin. For this reason, please always apply CAIS first, wait about 30 seconds (even 10 seconds is enough, but to be safe), then apply any acidic compounds. Please never apply an acidic compound before CAIS; if you do, the wait time would be significantly higher (30 minutes to be safe). Both the original and the reformulated CAIS come in 1% and 5% concentrations of copper peptides. The reformulated 5% will be called NIOD Copper Amino Isolate Lipid 5:3 (CAIL), have a heavier consistency, and will be released in early 2018. So should you choose 1% or 5%? Tl;dr: 5% produces quicker but not better results than 1%. Probably not worth the extra cost for most people ($200). I generally would not recommend using CAIS 5%. It will offer better results in the first 2-3 weeks but within a few months, you would be at the same position with either 1% or 5%. I would really only suggest 5% for periods of extreme recovery when skin immunity or quality has been truly low as a result of trauma. 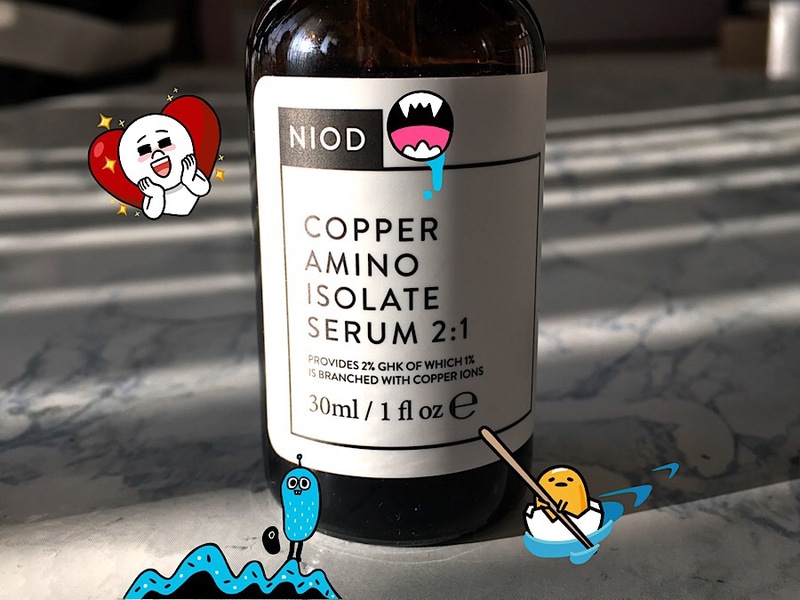 Have you tried copper peptides? Any recommendashuns? ohhh I want to try these! 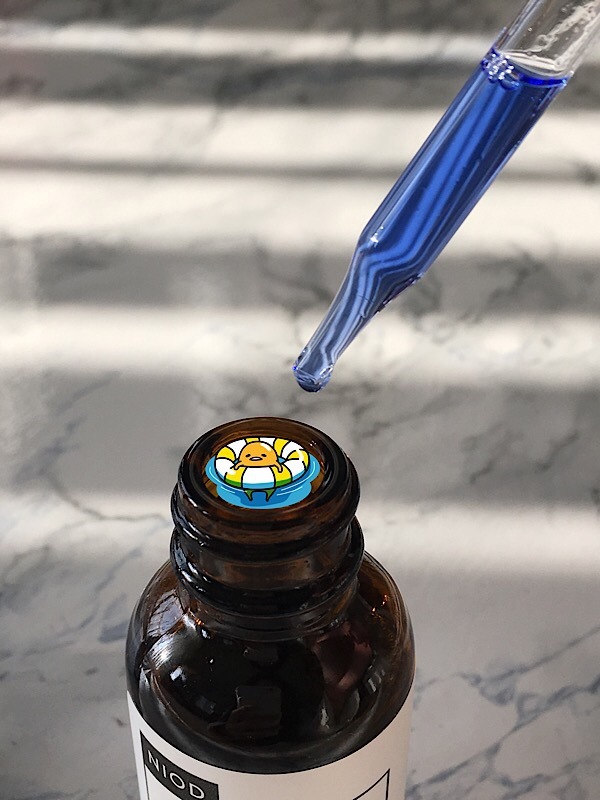 I have a product that works similar to this but it isn’t a copper peptide – it is the klairs midnight blue drops and has EGF and FGF in it. Yes, I saw it has guaiazulene for BLUE. 😍 Been tempted by it. I love how your blog has all the super cute drawings! Makes it so much fun! My aim for next year is actually to try out some NIOD products! As far as prices and versions go though, I don’t think I will even bother with the 5% because of the price tag. Also, I heard although the 5% gives perhaps a bit more immediate effects, in the end, the results are similar with 1% so it’s not worth the extra splurge. I tend to agree. Even if the 5% is better, unless your skin is extremely compromised, it would have to be like 2 or 3x better than 1% to be worth it. Great Blog I just subscribed! Aw thanks, Miss B.! Will check out your blog. Your Welcome Dear! ThnQ dear passing by! I hope you enjoy my blog!